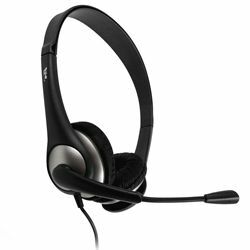 Engineered for both comfort and excellent quality, this analog stereo headset is great for Internet chatting or online gaming. 30mm dynamic drivers, direct noise-canceling microphone technology and a Y-splitter make the headset excellent for most smartphones, MP3 players, tablets, notebooks and PCs. The adjustable, over-the-head design fits comfortably on any head size, and the flexible boom mic's 180-degree rotation gets the job done, no matter your preference. The soft leather-like ear pads and the generous 7-foot power cord make the headset wonderfully comfortable to use for extended periods. Includes dual 3.5mm 3-band female to single 3.5mm 4-band adapter.